Each chapter of the eBook is dedicated to a specific objective and its sub-objectives and includes free practice questions for that domain. After you complete studying for the exam, you can use the review questions provided in this certification guide to assess your readiness to pass the exam. Use this test in bundle with other practice tests, because nothing helps to get the feel of the exam more than practice. Keep in mind that this guide in not intended to be your only preparation material; rather it is designed to complement other study materials, such as books and hands-on lab experience. 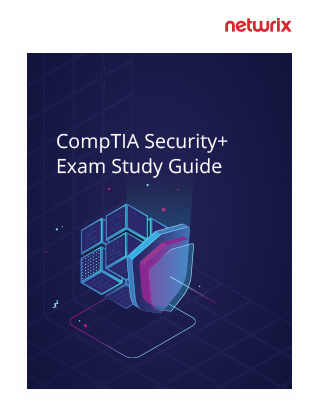 To be successful in the exam, you’ll need to be familiar with information security practices, basic risk management and cryptography concepts such as testing and digital signatures, network security best practices, and various security technologies, and be ready to use them to combat data threats and cyber attacks, including social engineering. You will need to understand how to securely implement systems and applications, including cloud technology. You will also need to know how and when to implement different user authentication methods, access control models and secure protocols. You can read it before doing any other studies for expert preparation advice: It will help you prioritize your study efforts by identifying areas in which you lack sufficient knowledge and therefore will require more attention during your studies. Alternatively, you can read this guide after you have finished your preparation to help you assess your level of expertise in each domain. You’ll be able to determine whether you are ready to ace the exam or there are still areas that require additional attention.